It’s that time again, time for Adopt A Gluten-Free Blogger. It’s been a while since I’ve participated in this monthly round-up. But, this month I had an extra special motivating factor. At the end of this month, I’m attending the Gluten-Free Allergen-Free Expo outside Chicago, Illinois. And, Hallie, the wonderful blogger behind The Daily Bites blog, is going to be my roommate for the night. We haven’t met yet, even though we live in the same city, but I’ve been a fan of her blog for a while. Hallie is known for her healthy whole foods recipes. And, I had every intention of trying out some of her fantastic-sounding savory recipes, like, perhaps, her Roasted Squash and White Bean Skillet, or perhaps her Simple Summer Kale Slaw. Um, does it surprise anyone that when it came right down to it, I wound up trying two baking recipes? I mean, really. Is that all that surprising? 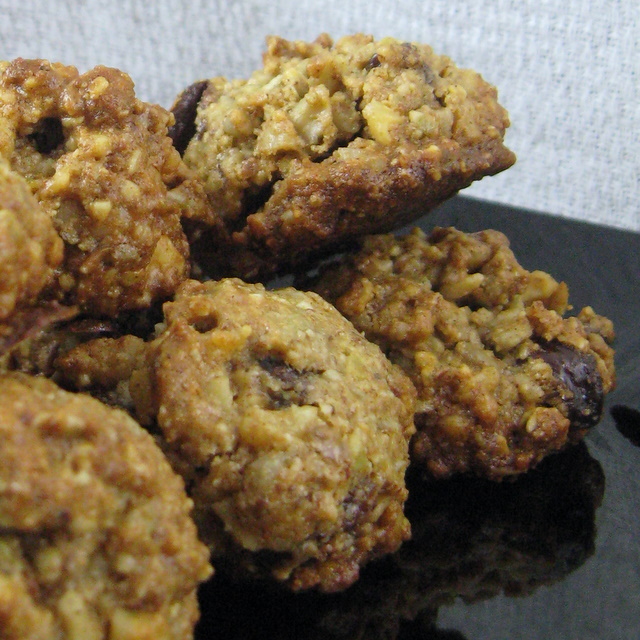 First up, Grain-Free Granola Balls. I made two small changes to this recipe. First, I swapped maple syrup for the honey, so the recipe would be vegan. Second, I completely forgot to buy dried blueberries. So I doubled the raisins instead. Oh dear me, I think I’m in love. Would it be bad to mention that I seriously considered filling a bowl with these, topping with some almond milk and calling it breakfast? I mean, people eat granola for breakfast all the time, right? Right?!? One note on this recipe, mine were done before the called for 20 minutes. It’s possible that the swap of maple syrup for honey caused them to cook more quickly. Not sure on that. 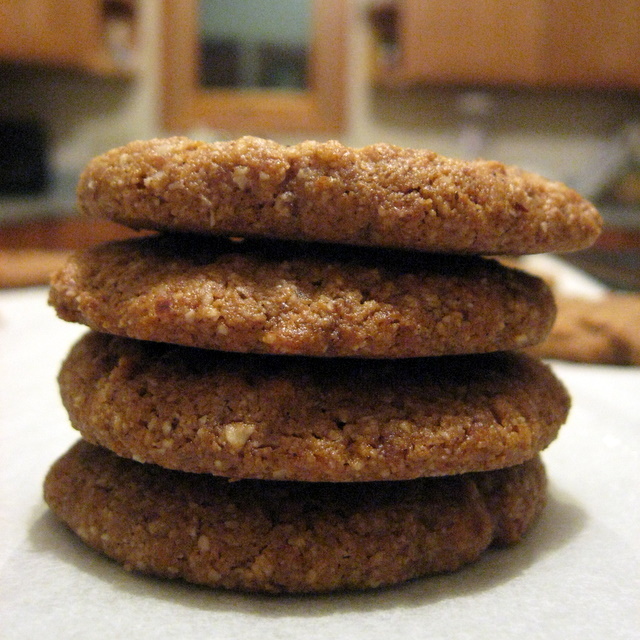 The second recipe I tried was her Nutty Molasses Cookies. Again, I swapped out the honey in these, this time for agave syrup. The result? Soft, sweet, glorious grain-free goodness. And, I’m not even the molasses cookie lover in my house. That’s the kiddo. I can’t wait for him to try these. I have a feeling they’re going to go into regular rotation. So, while I didn’t get around to trying one of her savory recipes, I’m still quite happy with my choices. I don’t think you can go wrong with any of Hallie’s recipes. And, in case you’re not already following her blog, she just came out with a Build a Better Breakfast Challenge. The wheels are spinning on that one and I’m hoping to have a recipe to submit for that challenge very soon. I hope you participate, too! I also love her lovely blog with never to fail recipes! I love Hallie’s blog but just realized I’m not signed up! Just registered for her emails. Those granola bites look and sound amazing! I looked at the ingredients – definitely breakfast material. Her blog is great, isn’t it? Hallie’s site was new to me and it’s really wonderful. Thanks for introducing me to it! The molasses cookies look amazing! Glad to introduce you to her. She really does have some great recipes. That’s one of the cool things about doing adopt a blogger. It’s always a great way to find new blogs to follow. Okay I really need to try those granola bites! They caught my eye when she originally posted them. And YES for breakfast. I’m with you on that one. I’m going to adopt Hallie one of these months!